I really like this product. I use it when I jog. EzyFit sports & exercise support products help those who want to get fit and healthy to be confidently active. Because achieving your fitness goals takes sustainable effort that is easy to maintain. And the best part is, with EzyFit you simply Wrap, Pat and Go! EzyFit sports support products are designed to be comfortable to wear while helping you stay fit and be active. Made with flexible neoprene that moulds with your body, double stitched edges to avoid scratching your skin and make them fully adjustable to fit properly. Effective heat therapy for joint pain relief and faster recovery so you can get fit and active quickly. Simply wrap, pat and go! Easy to use products that allow you to get out into your exercise routine with a minimum of effort. EzyFit - Simply Wrap, Pat And Go! 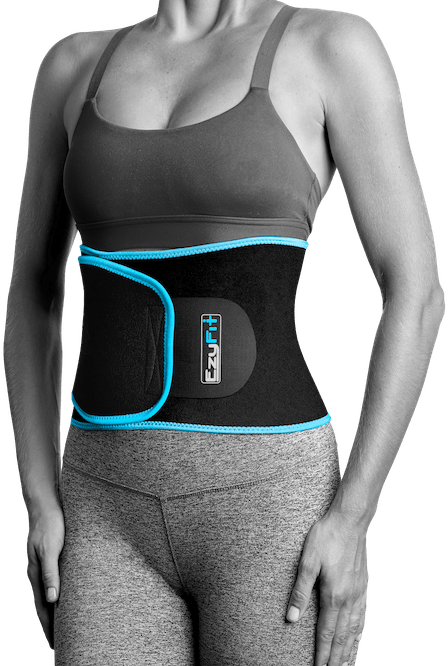 EzyFit Waist Trimmer Premium Weight Loss Ab Belt for Women and Men Exercise Workout. Sweat Enhancer Adjustable Fat Burner Stomach Wrap. Sweet Abdominal Muscle and Back Support, Black Blue Trim Fits 24" - 42"